YOUR INTENSIVE CARE HOTLINE - My father is in Intensive Care ventilated with LIVER FAILURE and KIDNEY FAILURE, I DON’T THINK HE WILL SURVIVE! HELP! My father is in Intensive Care ventilated with LIVER FAILURE and KIDNEY FAILURE, I DON’T THINK HE WILL SURVIVE! HELP! My father has been admitted to Intensive Care two weeks ago with a chest infection that turned out to be Pneumonia. The doctors put him on a breathing machine as his oxygen levels were quite low and he couldn’t sustain breathing by himself. The problem is that my father has been a heavy drinker for most of his life and he only recently slowed down drinking. He therefore has liver failure as well and he looks quite yellow, jaundiced and puffy. When my father first got into ICU and on the breathing machine his kidneys also stopped working. The doctor had a chat to me and he thought that putting my Dad on Dialysis for the kidney failure would be the right thing to do. My father has now been on the Dialysis machine for 6 days and the doctor says that his kidneys have hardly improved. He has also gone into an irregular heart rhythm and he required to be shocked to go back to a normal heart rhythm. His heart rate was up to 190 beats per minute! Another problem is that my father is ventilated but is on no sedation or pain killers. He seems to be tolerating whatever they are doing quite well. But he is also lifeless and he just doesn’t have any reserves left. The doctors have ruled out putting in a Tracheostomy, as he is at high risk of bleeding due to his liver failure. He is 68 years of age and I do think that the doctors will soon ask me what we think we should be doing next. Can you give any advice on this and do you think he has a realistic chance of survival? I’m very sorry to hear what you and your family are going through with your father’s stay in Intensive Care! I know how terrible you must feel given that your father has been ventilated for a couple of weeks and hasn’t really shown any improvement! Worst of all, you seem to mentally prepare yourself for the worst case scenario! But first of all, let’s look at your and your father’s situation from a few different ankles. Your father is currently ventilated and on no sedation and on no pain killers. This is of concern, given that most critically ill Patients on a ventilator require sedation and pain killers in order to be able to tolerate the breathing tube and the ventilator. It is also of concern that the Dialysis machine is not doing what it’s meant to be doing, which is to get the kidneys back to normal. Liver failure, kidney failure and Pneumonia with a ventilator is not a good situation for your father to be in. Especially the liver failure may cause some of the swelling that you’ve described, because usually Albumin levels in the blood are quite low and despite the Dialysis, this may actually not be enough to get the swelling down. The other issue is that if your father is apathetic and not showing any signs of life, then he won’t be able to come off the ventilator. Therefore a Tracheostomy could well be the right step, however your father’s liver failure puts him at high risk of bleeding and therefore it sounds like the Intensive Care team has ruled out a Tracheostomy for now! Now, your father, you and your family are in a difficult situation and you are facing a big challenge, because you are correct to point out that the Intensive Care team will want to make a decision regarding your father’s future treatment. If they have ruled out a Tracheostomy for now, they will most likely suggest a “one way extubation”, meaning that they want to remove the breathing tube without putting it back in. If your father is dependent on the ventilator this will most likely mean that he will die once the ventilator and the breathing tube have been removed. How long will it take to die after life support has been removed? I would imagine that the Intensive Care team will also suggest that Dialysis will be stopped once the decision has been made to remove the breathing tube and the ventilator. But here is the crux. What do you and your family want and what would your father want in this situation if he had the power to decide for himself? The only person who can answer this question is you, your family and your father. If you think that you or your father wants a Tracheostomy, then you should be asking the Intensive Care team to give him some FFP’s(Fresh frozen plasma) in order to minimise the risk of bleeding. They may also look at giving your father some Vitamin K(maybe they are giving it already) to minimise the risk of bleeding. In any case, you, your family and your father should be crystal clear in what you want. Would you, your family and your father be at peace if the Intensive Care team withdrew treatment? Or do you feel more comfortable in having more time with your father until you come to terms with what’s happening. What you also need to consider is that if the Intensive Care team suggests to stop or limit treatment, are they doing this because they sincerely believe that they can’t help your father or are they doing it because they need the ICU bed for other critically ill Patients? 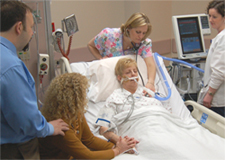 If the Intensive Care team considers or suggests a “WITHDRAWAL OF TREATMENT” or a “LIMITATION OF TREATMENT” as being “IN THE BEST INTEREST” of your father, are they doing it purely on medical reasons or are they doing this because they think that a longer stay and longer treatment would be an unnecessary burden to your father or are they suggesting this because they think that continuing treatment would cost them money that they could spend otherwise? It sounds to me like your father’s and your situation is pretty challenging, however you shouldn’t rush to make a decision and you should look at alternatives and you should be probing the Intensive Care team. You should also be thinking about what an end of life situation should like if your father was to pass away soon. You should give as much input as possible and you shouldn’t have the Intensive Care team directing the end of life situation, if that’s the path you want to go. End of life situations in Intensive Care are often handled poorly, simply because the Intensive Care team has a lot of other priorities and interests that tend to go way beyond your grief and your vulnerability in those situations. Therefore, you should have a say and you should direct the end of life situation as much as you can. If you don’t you might get disappointed and you might have bitter memories for the rest of your life. I hope this helps Anna and I wish you and your family all the best!